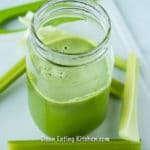 Here’s a celery juice recipe according to the Medical Medium, plus information about the benefits and how to make it in a blender. Prep the celery for juicing by chopping off the base and tops of the stalks of both bunches. Wash the celery gently and pat dry. Run the celery through the feeding tube of juicer (see blender instructions below). Juice the lime (optional). Serve the juice immediately, or keep any leftovers in an air-tight jar in the fridge. Consume within 3 days of juicing. *The Medical Medium says that you should not use anything else with the celery for optimal health, but I find using the juice of one lime makes the celery juice taste so much better. To make celery juice using a blender, you’ll need a nut milk bag or some kind of very fine mesh strainer to strain out the pulp. To make the juice in a blender, add the celery stalks in batches to your high-speed blender. Add ¼ cup of water to help get the blender started. Use your tamper to push the celery stalks into the blade. Keep adding the celery until you’ve blended it all. Then, pour the blended celery through the nut milk bag or strainer so remove the pulp from the juice. Serve immediately and discard the pulp.